Are you vegan or veg-curious and live in or near Ohio? Good news! The Cleveland VegFest is almost here, and this year the Cleveland Vegan Society has really outdone themselves putting it together. It’s going to be a jam-packed day of incredible speakers like Emily Moran Barwick of Bite Size Vegan, Michelle Cehn from World of Vegan, and the-totally-awesome-incredibly-inspiring-I-can’t-wait-to-hear-him-speak Phillip Wollen! Plus, there will be exhibitions, music, cooking demonstrations, kids activities and of course, awesome vegan food. I have to tell you, I’m extra excited for VegFest this year. This year, I’m bringing my dad with me to VegFest. I’m excited! This is new territory for me. Ever since my mom passed away, my dad and I have been spending more time together. Rather, we’re spending one-on-one time together. It’s not that we didn’t spend time together before, but our relationship was much different then. These days we’re talking more to each other about the things that are important to us, and since veganism is at the center of who I am, it’s been a part of our regular conversations. To be honest, my dad doesn’t get “the whole vegan thing.” He knows that vegans don’t eat animals, but he doesn’t really understand what that means. Like a lot of other people, he doesn’t understand that animal means all animals, and how veganism is much more than just a diet. It’s the specifics that confuse him. You might be thinking, “Why haven’t you talked to him and set him straight about veganism, aren’t you an activist? Isn’t that what you do?” Well, yes. You’d be right. I’ve had plenty of vegan conversations with my parents over the past twelve years that I’ve been living vegan though, without much success at all. For instance, he still asks me if I eat fish. Sigh. For the record, fish are animals. So no, I don’t eat fish dad. To date, I haven’t found that one fact/statistic/undercover investigation/pamphlet/book/documentary/thing that will reach my dad—the thing that will stick with him hours and days after he hears it—the thing that awakens the compassionate person within. If you’re vegan, you know what I’m talking about. It’s the thing that acted as the final straw- the thing that inspired your veganism. Everyone’s thing is different, it’s unique to each of us which is why we should always try a variety of vegan advocacy methods. Not that I’m trying to “turn my dad into a vegan” or anything. Ahem. Inspire and educate perhaps, but not force change upon. Though, my dad is a guy who took a vacation out west with my mother with the plans of eating his first buffalo burger. That is, until he met a buffalo. One look at big, beautiful buffalo in person was all it took for my dad to ditch his idea for a buffalo burger forever. It’s the power of sanctuary. So, I’m taking my dad to VegFest to see what he finds intriguing. I can’t wait to see what speaks to him. What about you? 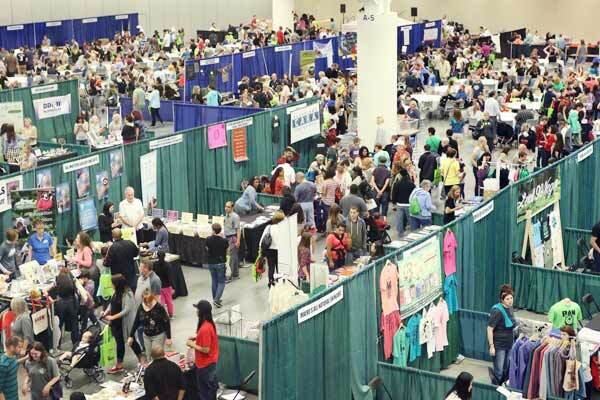 Are you going to the Cleveland VegFest? Please do (and say hi if you see my dad and I)! To help you plan the trip, I’ve put together this helpful guide. Here’s the low-down on who’s speaking and when, who’s cooking up delicious vegan food, who’s baking the vegan goodies, and where you’ll be able to check out cruelty-free items- plus other information you’ll need to help you plan a family-friendly day filled with fun. 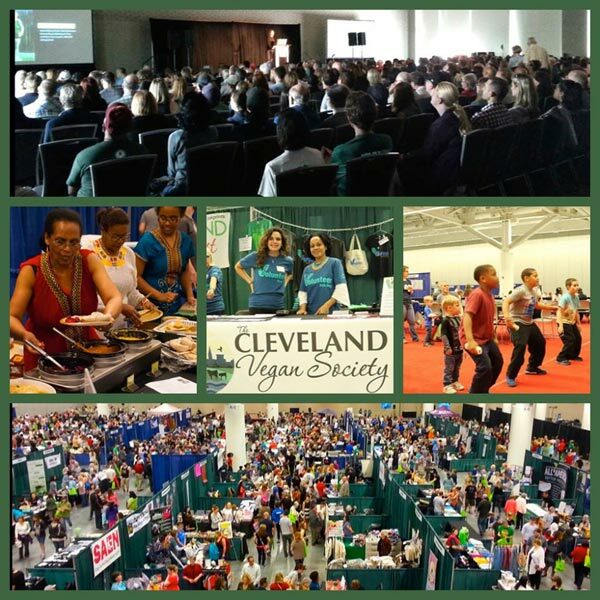 Cleveland VegFest features many top national speakers and authors in their fields on issues of health, environmental sustainability, social justice, and animal rights. It’s a great opportunity for the whole family to explore how choosing veganism directly impacts conditions in each of these critical areas. From food to music, to films and lectures, there’s something for everyone. The 2017 Cleveland VegFest is being held on Saturday, June 3rd from 11:00am – 7:00pm at the Huntington Convention Center of Cleveland located at 300 Lakeside Avenue East. The Cleveland VegFest is being held at the Huntington Convention Center of Cleveland, which has plenty of parking space available. Here are the parking facilities near the convention center, as well as their rates for each garage. Dr. Mason is the Chief Operating Officer of the Cook County Department of Public Health, the former Chief Medical Officer for the Cook County Health and Hospitals System and former Commissioner of the Chicago Department of Public Health. He’s currently responsible for public health programs and services for one of the nation’s largest metropolitan health departments, serving Chicago’s urban population of 2.3 million residents. Dr. Mason is a nationally recognized health educator and inspirational speaker who champions holistic approaches to health management and believes that real disease prevention is driven by food, policy, and the conditions where people work, live and play. He’s a seasoned health professional with 30 years of practice as a urological surgeon. Dr. Mason hosts a weekly radio health talk show, he’s a Telly award winning video producer, author and was also featured in the 2010 film Forks over Knives. Michelle Cehn is a filmmaker on a mission to make vegan living enticing, easy, and fun through gorgeous photography and visual storytelling. She is the founder of World of Vegan, co-author of The Friendly Vegan Cookbook, co-creator of The Dairy Detox, and a YouTube personality who has reached millions through her creative, relatable, and engaging vegan videos. Inspiring story about the power of one person to make a difference. Emily Moran Barwick is an animal-liberation activist, international speaker, artist, writer, and the creator of the YouTube channel and accompanying website Bite Size Vegan, where she provides free, educational videos and resources about veganism—backed by rigorous research, yet awkwardly entertaining. From thoroughly researched academic reports, to engaging videos for kids, to moving mini-documentary style videos, Emily provides a wide range of educational approaches for diverse learning styles, and emphasizes the diversity of veganism—that it’s not about changing who you are, just what you do in relation to non-human animals. Emily hopes to provoke an honest examination of our justifications for what we do to animals, beyond the surface of “that’s the way it’s always been”— to engender the realization that veganism, far from an extreme way of life, is simply aligning our actions with the values we already have. Lauren Ornelas is the founder/director of Food Empowerment Project, a vegan food justice nonprofit seeking to create a more just world by helping consumers recognize the power of their food choices. F.E.P. works in solidarity with farm workers, advocates for chocolate not sourced from child labor, and focuses on access to healthy foods in communities of color and low-income communities. While Lauren was the director of Viva!USA, she investigated factory farms and ran consumer campaigns. She served as campaign director with the Silicon Valley Toxics Coalition for six years. Explores impact of animal agriculture on the environment and why leading environmental organizations are afraid to talk about it. Paul K. Chappell graduated from West Point, was deployed to Iraq, and left active duty as a Captain. He is the author of the seven-book Road to Peace series. The first five published books in this series are Will War Ever End?, The End of War, Peaceful Revolution, The Art of Waging Peace, and The Cosmic Ocean. Chappell serves as the Peace Leadership Director for the Nuclear Age Peace Foundation. Lecturing across the country and internationally, he also teaches courses and workshops on Peace Leadership and Peace Literacy. He grew up in Alabama, the son of a half-black and half-white father who fought in the Korean and Vietnam wars, and a Korean mother. Growing up in a violent household, Chappell has sought answers to the issues of war and peace, rage and trauma, and vision, purpose, and hope. Lee Hall is the author of On Their Own Terms: Animal Liberation for the 21st Century. A former airline worker, Lee was first motivated to become an activist by the plight of shipped animals. 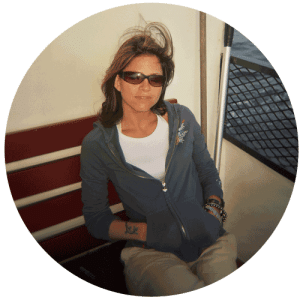 Lee has published on nonhuman personhood and gender in advocacy, taught Animal Law and Immigration and Refugee Law at Rutgers-Newark (2001-2004), and served 11 years as legal director of an animal-advocacy NGO. Lee recently earned a specialist’s law degree (LL.M.) in Environmental Law from Vermont Law School, and developed an Environmental Law course for Widener University – Delaware Law. A columnist at CounterPunch, Lee also authored the entries on Vegetarianism and Environmental Racism for the Encyclopedia of Activism and Social Justice. Mockumentary set in 2067, looks back at a time when humans ate other animals. Will Tucker is a 4 Time Natural Bodybuilding Champion, author, certified fitness trainer, and contributor to Vegan Health and Fitness Magazine. He is a fitness expert and award winning professional vegan bodybuilder who constantly dispels the myth that large amounts of animal protein are required to build an outstanding physique. His philosophy is that all the nutrients the body requires are available in a well balanced, plant-based diet that is high in carbohydrates with minimal amounts of protein and healthy fats. He focuses on giving the body what it needs on a cellular level to obtain better health while maximizing aesthetics. As a certified fitness trainer, he relies on his 20+ years of fitness experience to help his clients develop plant-based nutrition and exercise plans that fit their individual preferences and needs. Many of his clients have eliminated the need for prescription medications while eradicating physical ailments. Robert Grillo is the director of Free From Harm which he founded in 2009 to advocate on behalf of farmed animals and to bring awareness to how animal agriculture is connected to all other forms of exploitation. As an activist, author and speaker, Grillo draws insights from popular culture, sociology, psychology, ethics and social justice to bridge the gap between humans and other animals. As a marketing communications professional for over 20 years, Grillo worked on large food industry accounts where he acquired a behind-the-scenes perspective on food branding and marketing. His new book, Farm to Fable: The Fictions of Our Animal-Consuming Culture exposes the many ways we have all conditioned into a culture where mass animal consumption is the norm. Investigative documentary that will be an eye-opener for everyone concerned about our nation’s health and how big business influences it. Brenda Sanders is a food justice activist in Baltimore City who has dedicated her life to fighting for vulnerable populations. As a community organizer, Brenda has coordinated events like The Vegan Living Program, an annual 6-week vegan education program, Eating for Life, a plant-based cooking workshop, Vegan SoulFest, a festival that celebrates culture and the vegan lifestyle and she’s a founding member of PEP Foods, a vegan food collective bringing affordable plant-based foods to marginalized communities in Baltimore. Brenda promotes veganism in her social justice work because it’s a lifestyle that addresses health disparities, environmental destruction and animal abuse and gives individuals the ability to effect real, positive change in the world. Jane Esselstyn is an avid and inventive designer of plant-strong recipes and the co-author of The Prevent and Reverse Heart Disease Cookbook. She created the recipe sections of #1 NYTimes bestseller, Plant-Strong and The Engine 2 Seven Day Rescue, by Rip Esselstyn. Jane is a fresh, charismatic voice bringing her perspective and passion as a nurse, researcher, mother, and teacher to her presentations, food demonstrations, and cookbooks with clarity, hilarity, and a can-do attitude. Jane and her husband Brian Hart live in Cleveland, OH with their three plant-based children. Jane graduated from the University of Michigan, where she competed nationally as a recruited swimmer and varsity rower. How eating fish is harming our ecosystem. Philip Wollen is an Australian philanthropist and a former Vice-President of Citibank. At age 34, the Financial Press placed him in the “Top 40 Brightest and Best Executives” in Australia. He now supports 500 humanitarian projects for children, animals and the environment in 40+ countries, supporting schools, hospitals, orphanages, shelters, clinics, ambulances, bore-wells, sanctuaries, medicines, food and disaster relief. The Australia Day Council wrote: “Essentially a private man, Philip seeks no personal publicity. But he is not afraid to step into the limelight for a just cause”. Rupert Murdoch’s press described him as “reclusive”. In 2005 he received the Queen’s Birthday Honours Order of Australia, Australian of the Year Victoria 2007, Honorary Fellow -The Oxford Centre of Animal Ethics (2012) and in 2014 he received Distinguished Alumni Award University of Adelaide. Features leading medical experts and researchers taking a scientific look at the reasons Americans are so sick and what we can do about it. For even more information on the 4th annual Cleveland VegFest, please visit The Cleveland Vegan Society.